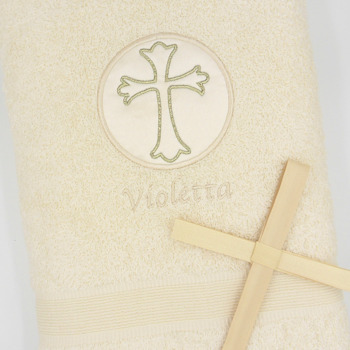 Ivory cotton towel embroidered with an applique Holy Cross motif and a name personalised, special gift for a Christening, Baptism or Wedding. Ivory cotton towel embroidered with an applique Holy Cross motif and a name personalised, special gift for a Christening, Baptism or Wedding. This ivory cream bath size towel is adorned with a lovely cream satin applique embroidered circle with a metallic gold cross in the centre. Personalised underneath the motif with a name in cream thread to coordinate and look subtle and soft. Ivory cotton towel embroidered with an applique Holy Cross motif and a name personalised, special gift for a Christening, Baptism or Wedding. This ivory cream bath size towel is adorned with a lovely cream satin applique embroidered circle with a metallic gold cross in the centre. Personalised underneath the motif with a name in cream thread to coordinate and look subtle and soft. Please select the font style and enter the name or initials to be personalised on the Baptism towel. Please allow at least 48 hours for personalised orders to be dispatched as they are made to order by Amys Gifts.